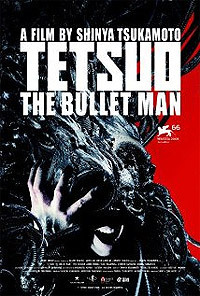 Tetsuo: The Bullet Man (2009) - Sci-fi-central.com. Japan  2009  71m   Directed by: Shin'ya Tsukamoto.  Starring: Eric Bossick, Akiko Monô, Yûko Nakamura, Stephen Sarrazin, Tiger Charlie Gerhardt, Prakhar Jain, Shin'ya Tsukamoto, Michael Duncan, Mike Duncan, Alan Koji, Sou Fujita, Markus Wambsganss, Hajime Izuki.  Music by: Chu Ishikawa. Tetsuo: The Iron Man - A film so manic, hyper, weird, and stylish, it represented the epitome of an experimental film. David Lynch would have gouged his eyes out. Tetsuo II: Body Hammer - A sequel so intense and crazy, it took the strange visions of the first film and spat them out at the viewer in a refreshing barrage of insanity. The third Tetsuo film, The Bullet Man, is pretty much more of the same. You can certainly expect the film to break out in hyperactive bombardments of flashing rapid-fire images. You can certainly expect the main character to mutate into a metal monster and wreak some havoc (and this time, he spits bullets!). You can certainly expect this to be weird and crazy. However, this Tetsuo film is notably different, and not in a way that's refreshing or necessarily good. In between the manic freak-out scenes, the film slows down drastically, trying its best to weave in some semblance of an actual story with actual characters and actual reasons behind the madness. With the terrible dialogue, short runtime, and overall freakiness of the film, I really don't think this story works as well as it wants to. The film really wants to give a compelling vengeance story (the exact same type that went into the last two films), it really wants to give us emotional characters, and it wants to give us some kind of background to the "Tetsuo Project" and its connection to the characters. In the end though, it comes off as being too short and underdeveloped for its own good. The experience of the film overall is pretty agitating. Granted, the other Tetsuo films are agitating as hell, but The Bullet Man seems to be a grade worse. Nearly every scene is shot with a camera that never sits still. Given the other issues listed above, I was rather apathetic about the film overall. I actually value the other two films for their remarkable styles and visions, even though they are pretty hyperactive in their own right, but this third film never felt like it brought anything new to the table. In addition to being really hyper and annoying, the film is rather drab-looking, with lots of dark lighting and gray settings. Photography is among the worst I have ever seen, and the editing is crazy. I was personally appalled by the acting and writing; most of the dialogue is terrible, with very stupid lines and absurd delivery. On the plus side, the sets, props, and costumes are pretty decent, and it's especially cool to see that the filmmakers preferred to use practical effects rather than cheap CGI. Music consists of lots of airy noises and metallic banging, further adding to the annoying experience. As much as I value the first two Tetsuo movies, I couldn't bring myself to enjoy The Bullet Man as much as I wanted to. I halfway wonder if Shin'ya Tsukamoto is purposefully trying to make the most annoying movie possible. Established Tetsuo fans will probably enjoy The Bullet Man, but casual viewers will probably want to keep their distance. I personally recommend the first film, if at all interested. 25 (Experience: Annoying | Story: Very Poor | Film: Marginal). Review by Al_The_Strange from the Internet Movie Database. Film Review: Tetsuo: The Bullet Man.